Lots of activity from Doctor Who Legacy recently, including lots of promotions, extra experience, new perks (interesting mixes of good and bad at the same time) and the one time buff system. 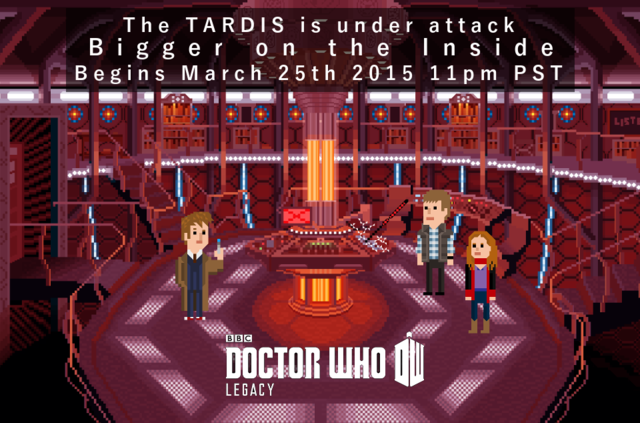 This week we will also get the start of the pixellated Bigger on the Inside levels. In the middle of all this activity I ask one question – has Doctor Who Legacy gotten distracted? Why do I think it might be distracted? There have been no new concepts for a while. Yes we had the advent levels, which were fun and some episodes released alongside the new Capaldi Twelfth Doctor stories. And that’s it. We’ve had some new characters, but if you’ve completed the recent Expert levels then, like me you are now killing time getting all your characters levelled as far as they can go. What’s happened to the original idea? When will we get new content from earlier in the show’s history? The team at Tiny Rebel Games needs funds, so it pushes the Fan Area. It needs publicity, so it goes to conventions and markets. I understand all this, but at some point having a fan version of Osgood is less exciting (for me at least) than the prospect of levels from Big Finish, the Ninth Doctor, maybe Torchwood and of course classic Who. There are plenty of companions we don’t yet have in the game. Can we have some more content please? I love the game but I definitely would like more classic characters. I once asked Frazer about it and the way he reacted I am not even sure he understood what the game was. I understand getting permission may be an issue but maybe they aren’t approaching it in the right way. I mean looking at his past history I would think Frazer would be excited about the game if he understood what it it was and that is just one example. I would also like more BigFinish characters but classic Who should come first over all the one ep characters. I think the rot starts with the writing of the series an Moffatt should go. Shoot the Moon and Forest were not science fiction. That adjective is important. A lot of us are data mavens, iNTjs and pretty rational types and this is getting tiresome. Just look at the debate about “which Dr is this?” He’s the 12th, but has regenerated 13 times…but calls himself the 11th??? Yeah, that’s from page 13 of the 2015 Dr Who Annual. WTF??? Besides demonstrating a level of logic that wouldn’t pass in a dimestore romance, it’s not even correct. When has the Dr. ever called himself “the Eleventh Dr”? And what did the title of “The Eleventh Hour” mean? Thankfully Frazer Hines is still doing great 2nd Dr roles for Big FInish and we have the rest of BF, but the series, imho, has totally jumped the shark. A whole season and he couldn’t get on with finding the Time Lords. We bring back the Master for…what??? A “could have been steamy lesbian love scene”? You know if the producer/director cared 1/2 as much for the fact that its SCIENCE fiction instead of figuring out every opportunity to add gay inuendo…well, they’d be doing their job. He’s too big for his breeches. Show ‘im the curb! Sorry, man, I read that as “Has the Dr Who legacy gotten distracted”, as opposed to the proper noun. Thought the game was just an example. Didn’t realize that it was a question about has the game become distracted… I’m afraid I’ve a kind of dysopia where video games are concerned. I can look at the page and the image doesn’t even register on my retina. 🙂 I’ll read closer in the future before adding a peripheral comment. That explains it! Thanks again for taking the time to contribute! I’d really like to see the Gallifrey and Bernice Summerfield cast on there- fighting monsters using Braxiatel would be awesome, really!